What did you love best about Prayers that Bring Healing? John Eckhardt capsulizes timeless, biblical wisdom of the healing power embedded within us, offering key scriptures that unlock the vital foundation for deliverance, restoration and wholeness. The greatest character of this book is the High Physician Himself --Jehovah Shalom-- the Prince of Peace and Healer of all that is created. Which character – as performed by Mirron Willis – was your favorite? Narrator Mirron Willis provides authoritative boldness that's apropos of Eckhardt's writing. Consistent declarations of these prayers can bring empowerment and health to those willing to believe. I personally recommend daily hearing and devotional study of this book for sound multiple healthcare. Without wanting to sound cliche, this is just what the Doctor ordered! 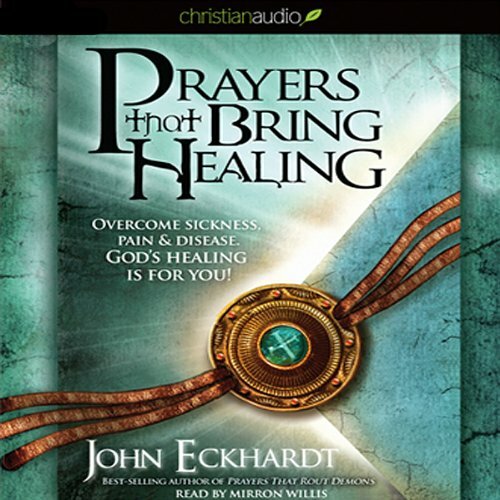 "Prayers That Bring Healing", authored by John Eckhardt, is an ideal gift in both hard copy and audio formats... I made sure I treated myself first! Revelations of the healing power of God and prayers to release those revelations based on the Bible permiate this book. I highly recommend if you desire healing and health for you and those around you. The performance seems haulting and a bit overdramatic with the extrnded pauses between sentences and commas, but the voice itself is good. I listen over night and the rest I get is wonderful. This is highly recommended . This is an encouraging and very well put together book. The narrator did an excellent job. Teaches you so much on how to pray the Word for healing. I didn't too much like how Mirron Willis read the book. His voice didn't fit, and he paused too much while reading it. And how could someone narrate a Christian book by a Christian author and then narrate a book for homosexuals?! (Mirron Willis) otherwise, the book was awesome. This is a wonderful book for people standing in the need of healing. I recommend this book to all. As a Christian and someone who suffers from chronic pain and disability I was hoping for a devotional book to give me comfort. Unfortunately the author seems to have a viewpoint that sickness is brought from oppression that bordered on blaming the sufferer for their illness. It certainly put me off a large proportion of the book.